Author Etta Brown received her undergraduate degree from the Ohio State University with a major in Dental Hygiene Education and the Masters in Education degree from South Carolina State University with a major in Special Education. The Educational Specialist Degree was conferred at Kent State University with studies in School Administration, and a major in School Psychology. Through her graduate programs, and internships, the author acquired skills with speech and language, visual-motor training, auditory training, and the teaching of reading and handwriting. During twenty years of professional experience in the public schools in Ohio, Iowa and California she has worked as a special education teacher, a school social worker and as a school psychologist. At no time, in either of those positions did she feel that she was able to apply any of her acquired knowledge to help children to learn. While the summer months might not be the time one wishes to think of learning issues, the reality is that parents must be informed if it has been suggested that their child might have a learning disability. 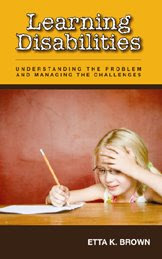 In Learning Disabilities: Understanding the Problem and Managing the Challenges, Etta Brown takes readers on a three-part journey through understanding the problem, managing the administrative challenges–having been through this I can tell you it isn’t fun when you don’t know what you’re doing–and managing the challenges in the classroom. Today, Etta will discuss the topic of least restrictive environment. I will also be posting an interview I performed with Etta at The Book Connection. The purpose behind the legislation which mandated the “least restrictive environment” for the special education student was to preserve the integrity of the student’s social status which has been identified as having a positive influence upon achievement. This is particularly true for children in the same neighbourhood who have grown up together, and are now separated. The presence of the special child in the classroom challenges the teacher and student to respect individual differences among the people in their social environment. The challenges of the special student in the classroom are minimal when compared with the overall benefits to the group. Even when the child is severely handicapped, and is unable to benefit from the instruction, they benefit from the social interactions which teach those behaviours which make them socially acceptable out of school. It has been well established that learning disabilities are handicapping only in the classroom, and these children function well and are socially well adapted in the out-of-school environment. When isolated from their normal peers, they have limited exposure to the wide variety of learning experiences which are readily available in the general education classroom. There is very little evidence that children who are placed in isolated learning situations ever return to the regular classroom, and it is not well documented that they learn more in special placements. When learning disabled children are placed in special classrooms, they continue to underachieve, and fall farther and farther behind their non-handicapped peers. The question which must be addressed by the IEP team is whether special education is appropriate for the child even if he is eligible. Advantages and disadvantages of special placement are seldom weighted when a child is eligible. Very often the motivation for referring the child for assessment is because the child presents a challenge to the classroom teacher, and she would rather not work that hard, or she does not have the kind of training necessary to accommodate the needs of the learning disabled child and believes that being placed in special education will be benefit the chid. Some professionals have even stated that special education will “fix” the child’s learning problem. Nothing is farther from the truth. Special education modifies teaching methods so that the child can perhaps learn visually when he has difficulty retaining what he hears. Special education does not “fix”, heal, modify or change the child in any way. There are some rare, highly qualified well trained teachers of special education who make school less challenging for learning disabled children, and their student learns, and remains at grade level. However, this is rarely the case in most neighbourhoods, and children once placed in these environments beg to be returned to the regular classroom, and many drop out as early as sixth grade. It is an uphill battle championing this cause, and the professional who does so, becomes unpopular in a setting where enrolment is down and numbers are needed to keep that class funded, so that teacher can remain at the school where she has worked for several years and has important social connections. This problem is addressed by the legislature by empowering parents to champion this cause for their own child. The powers granted to parents now supersede those of the school, and it is necessary for parents to become informed regarding their rights, and become actively involved in the special education process so that they can claim those rights. Ms. Brown has met this need with a parent manual entitled LEARNING DISABILITIES: Understanding the Problem and Managing the Challenges. In the book the author empowers the parent with information that it is not in the best interest of the school for them to know. However, without this information, Ms. Brown feels that parents cannot fulfill the role delegated to them by the legislature, and parents are the only safeguard against inappropriate special education placement. In most cases, parents are unaware that their child cannot be placed without their permission, and fail to claim their rights under the law. Even after the IEP is completed, many parents remain unaware that they had the right to say no to special education and demand an appropriate placement for their child. Full inclusion with special assistance in the regular classroom is seldom suggested to parents.